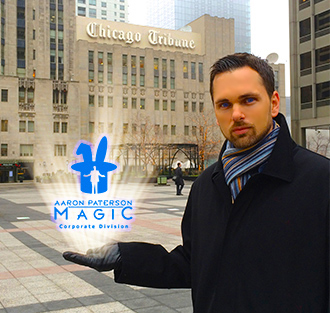 Toshiba brought Aaron Paterson to Chicago to entertain important clients at the annual RSNA conference - the largest conference of its kind in the world, featuring Condaleeza Rice among many other VIPs. Aaron Paterson was invited by Toshiba Medical Systems America and Toshiba Medical Canada to perform for some of their most important clients. 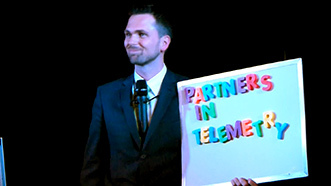 Having experienced some of his magic for a symposium in Canada earlier in the year, Toshiba was confident that Aaron would provide the first class entertainment that they were looking for for such an important event. Taking place at the beautiful Intercontinental Hotel on Chicago's Magnificent Mile, the event was attended by more than 250 radiologists from around the world. Aaron weaved magical interludes with the companies key message to provide interactive entertainment that bolstered a standing ovation from those participating. Aaron would like to thank Toshiba for retaining his services for the second time in just a year and looks forward to working with them on future events. 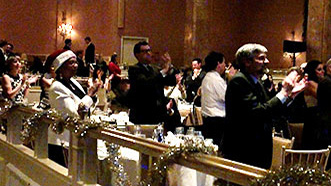 Aaron Paterson takes on the world famous Imperial Room at the Royal York Hotel, entertaining for one of the premier business law firms in Canada and receives a standing ovation from participants. 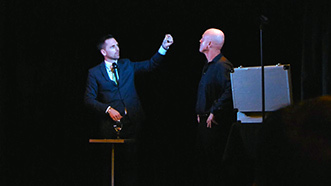 Canada's premier business law firm, Bennett Jones, recently retained the services of Canada's leading illusionist, Aaron Paterson. 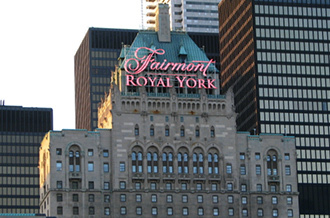 This employee event took place at Toronto's historical Royal York Hotel in the world famous Imperial Room that has previously played host to the likes of Jim Carrey, Sonny and Cher, Bob Hope, Chuck Berry, Doug Henning, Moxie Whitney, Rich Little, Ella Fitzgerald, and Tony Bennett to name a few. Aaron enjoyed playing such a famous room and is grateful to Bennett Jones for their patronage over the years. 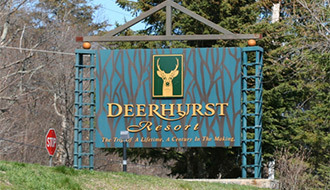 Aaron Paterson performs at the world renowned Deerhurst resort for pharmaceutical advocacy group OnPharm to rave reviews. Thank you for putting on such a wonderful show. We have received nothing but great feedback from attendees. It was our pleasure to have you and we will certainly keep you in mind for future events! 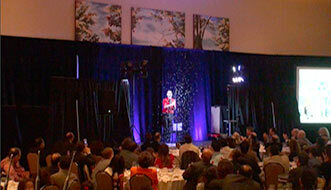 Aaron Paterson provides corporate entertainment in Ottawa for Canadian technology giant CDW. 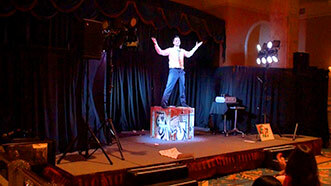 Corporate entertainment professional, Aaron Paterson captivates guests at Lotek Wireless employee event. World leaders in the design and manufacture of fish and wildlife monitoring systems, Lotek Wireless recently retained the services of the leader in Canadian illusionary entertainment, Aaron Paterson for their recent employee event. Aaron whet their appetite with his Mingling Entertainment as guests arrived and followed that with an After-Meal, Comedy Magic and illusion show that had the audience of mostly Engineers baffled as he apparently defied the laws of nature in some spectacular demonstrations of pure magic. The audience showed their appreciation with an enthusiastic standing ovation. Aaron was able provide full audio visual, production support for Lotek in order to ensure the complete success of the event. Lotek was so happy with Aaron's services that they recommended him for another event for one of their associates. Thanks again for such a great evening. The buzz is going around here today, and I just caught two of our engineers discussing the evening and how you did it!! 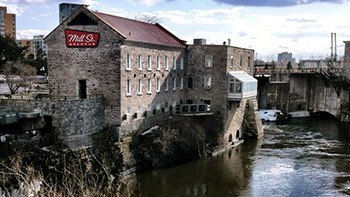 Historical turn-of-the-century Kitchener landmark, The Tannery played host to some spectacular illusion from Aaron Paterson. Kitchener based company Spaenaur booked Aaron Paterson to entertain at their recent employee event and as result they had the largest turn out for the event in years. 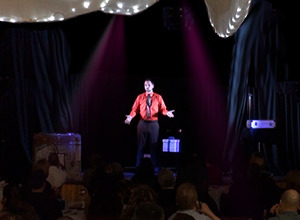 The event organizer commented that due to the incredible entertainment provided by Aaron, that the event was the most successful it had ever been. The Historical but redesigned conference space at The Tannery was well equipped with incredible state-of-the-art audio visuals for the performance and Aaron received a standing ovation for his contribution to the event. The company president was called upon to participate in the performance where Aaron caused his Jacket to disappear while being worn. 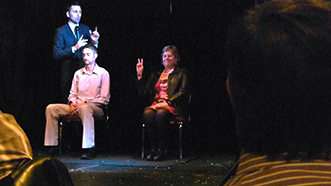 The audience of 120 guest laughed, applauded and was thoroughly amazed over the hour long performance. The performance was augmented by wall to wall screens that broadcast various graphics to enhance the visuals of the show. A thoroughly enjoyable evening was had by all. 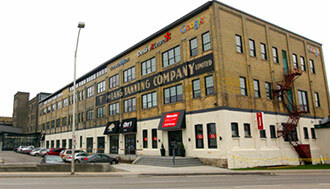 Are looking for Corporate entertainment Kitchener? If so, you have come to the right place, click here to contact us now. 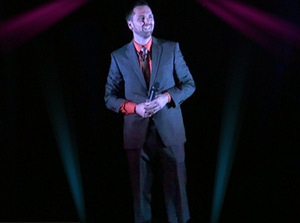 Aaron Paterson performs for 400 attendees at a recent Manulife Financial, Town Hall Meeting and receives a standing ovation from the enthusiastic participants. John Hancock, a division of Manulife Financial recently commissioned Aaron Paterson and company to wow guests at their Operations Quarterly Town Hall meeting. 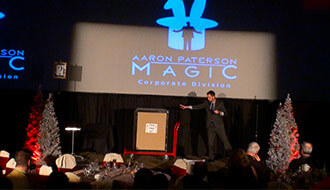 Aaron performed for almost an hour for the 400 plus attendees with a customized presentation that included comedy, magic, mind reading and tons of audience interaction. Aaron was able to make the entire audience feel like part of the show and at times had them laughing so hard that he had to pause to let them catch their breath before continuing. Aaron was happy to work directly with Manulife to troubleshoot venue limitations and come up with a solution that was a win-win for all involved. 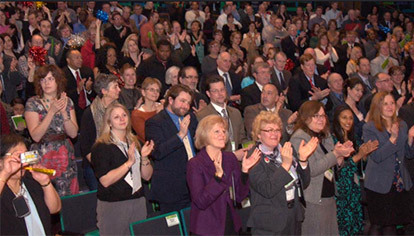 Guests were so enthused with the performance that they showed their appreciation with a spontaneous standing ovation. Aaron enjoyed returning to perform for Manulife and looks forward to working with them on future events. 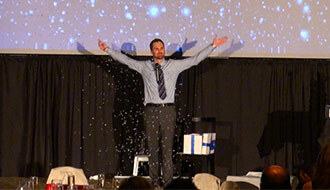 The Crupi Group brings in Aaron Paterson to change up an annual employee event and the results are outstanding. 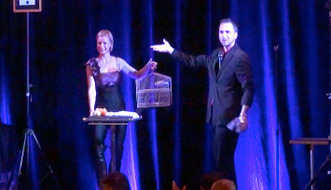 The Crupi Group of construction companies was looking for something unique and different for their annual employee event and as result, retained the services of Canada's premiere illusionist, Aaron Paterson. The result was one of the most successful employee functions they have ever had. With a very diverse crowd, Aaron was able to customize a performance that included something for everyone. However, don't take our word for it, read what The Crupi Group had to say about our services. We were thrilled with how much you engaged and captivated everyone in attendance (including the serving staff and owner of the banquet hall who were talking about the show afterwards). As I mentioned to you it is not an easy crowd to please, yet everyone thoroughly enjoyed the show. We have had countless people come to us commenting on how much they enjoyed themselves, that this was the best Christmas party we’ve had in a long time and that your performance was amazing. Even today, I keep overhearing people debating and trying to figure out how you did some of the tricks you did. I am so glad you were available to do the party and that I managed to find you – I couldn’t be happier with what you delivered and you helped us accomplish exactly what we wanted to with our employees so thank you so much. You truly are an amazing entertainer and a superbly talented magician. We will definitely pass on your name when other events come up and I’m sure we will be calling you again. 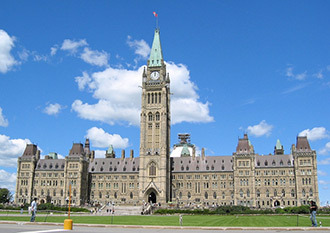 Aaron Paterson is brought in by Face to Face Events to provide corporate entertainment in Ottawa for important clients at a recent pharmaceutical conference. You were a terrific entertainer for our event and I sincerely appreciate everything you did to make the event unforgettable.